After collecting price data for more than 4 years, we decided to run the numbers on Eve Online's economy to see how the market developed and what events triggered which consequences. For this we looked at the data surrounding game expansions, heists, bannings, Chinese New Year and overall player engagement. 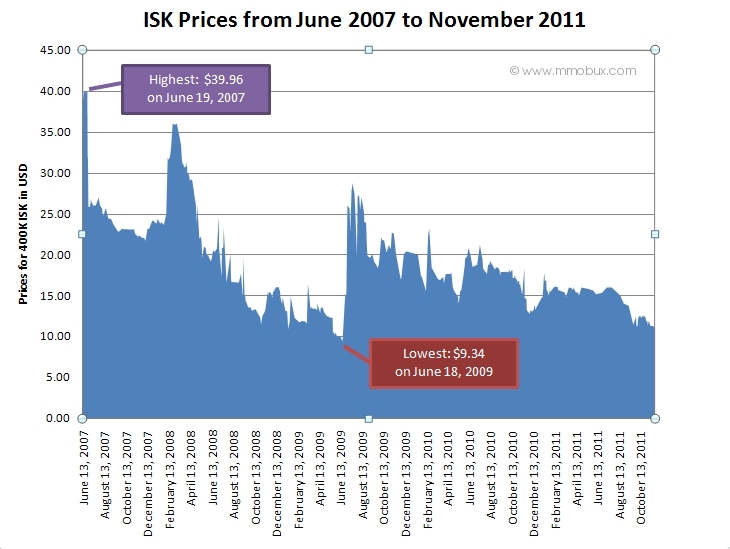 As you can see at first glimpse, median prices for ISK have gone down over time. On average, ISK prices declined at 14% per year in the observed time frame. The average of the daily median prices in 2011 ($14.29 for 400 million ISK) is close to half of the price in 2007 ($26.62 for 400 million ISK). This is in line with most games that have more currency entering the game (e.g. from mining or looting) than exiting it (e.g. repair cost of equipment). However, there were some serious bumps along the way and we'd like to review what caused them. Theories for price hikes are abundant so let's take a look at how well they hold up in practice. When it comes to predicting game currency prices, many people assume that prices shoot up during the Chinese New Year ("The ISK farmers are on vacation, there's no supply!"). According to our shop data, a majority of suppliers for the international server do indeed originate from China. As such it doesn't seem far-fetched to assume that the biggest holiday in the country might have a significant impact on supply and consequently prices. 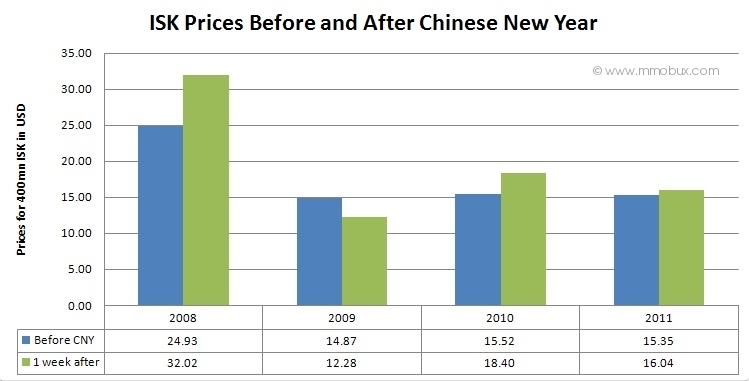 We went ahead and compared prices before the Chinese New Year with the prices shortly after the holiday in each year. The data shows that in most years (though not all) there was indeed a price increase. On average there was a hike of 22% within the first few days after Chinese New Year (festivities are heaviest during this time). 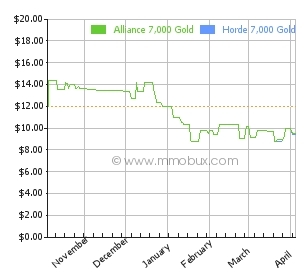 In the weeks following, prices returned to their old levels and continued to fall, presumably as the ISK farmers return to work and supply returns. Expansions often introduce new locations, features and ships that can lead to old players resubscribing, inactive ones logging back on again and current gamers increasing the amount of time they spend in the game. This is a big factor in Eve Online since its expansions are released at no charge and with the goal of retaining and broadening its subscriber base. If demand for ISK is indicative of subscriber engagement, this strategy seems to have worked. But what if an expansion repels the fanbase instead of exciting it as what happened with the controversial Incarna expansion? First a quick recap: The release of Incarna on June 21, 2009 resulted in massive player protests. Public player anger focused in part on the prohibitively high priced vanity items in the then-newly launched cash shop (including the infamous $68 monocle). However, the biggest PR fallout probably came from a leaked internal e-mail in which CCP CEO Hilmar Veigar PÃ©tursson reminded the company's employees that 'this is one of the moments where we look at what our players do and less [at] what they say'. The data above shows that Incarna had a significantly lower impact on prices than previous expansions. While it still shows an increase (which is counter to the general trend) it does not measure up to previous, more popular expansions. We saw there is a correlation between expansion releases and price increases for the observed time-frame. However, it's not clear if this is more due to additional spending opportunities (e.g. players buy ISK so they can access new content right away) or more engagement in the form of more players or more played hours per player. To get a better idea of the effect, we decided to look at some other games which experienced significant changes in player engagement after we collected the EVE data. One of them was World of Warcraft (WoW) at the time Star Wars: The Old Republic (SWTOR) was released, the other Aion, which recently went free-to-play. 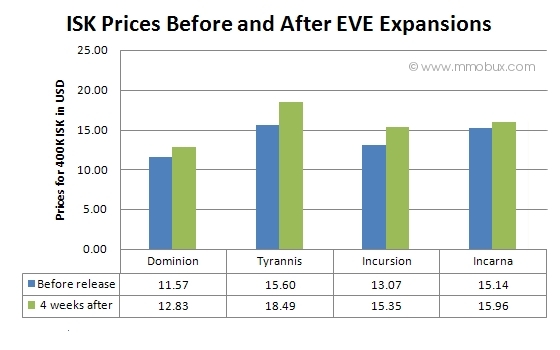 Applied to EVE Online, a comparable top-tier MMO, we believe that player engagement also plays a key role in how ISK prices behave. time of writing are even increasing again, but this can be attributed to different factors. Eve Online owns part of its popularity to its sandbox-style game-play that gives players a lot of freedom in interacting with each other. Unsurprisingly, those interactions aren't always of the nice kind, though they do seem to be quite good at imitating real life. Inadvertently the high-profile heist induced a major crackdown on ISK sellers, which CCP codenamed "Operation: Unholy Rage". Up to 6,200 accounts of suspected ISK farmers were banned on June 22, 2009 alone, resulting in a prolonged drought of supply. The question at this point is if the heist directly or indirectly caused the price hike or if it was due to 'Operation: Unholy Rage'. Aside from ISK sellers getting caught by purchasing the ISK, it's also possible that some ISK sellers had deposited their own stock in that very bank - partially for profits, but also to 'virtually' launder the ISK. When Ricdic made a run for it, they would have lost their stock just like every other lender. In order to determine the cause, we can look at other heists and their effect on the EVE economy. This list of EVE heists gives us several data points to look at, e.g. September 2010 (Titans4U Scandal) and August 2011 (Phaser Inc. Scheme). 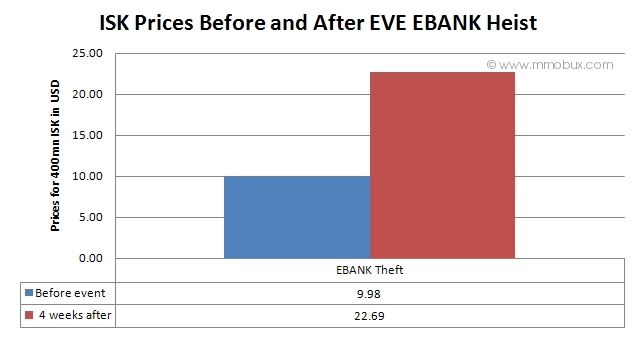 However, neither those two nor any other heists seem to have had an effect on EVE prices. This seems to be in line with CCP's own statements that none of the heists had a serious lasting impact on the economy. It appears players can affect prices by playing more, but not by robbing virtual banks. This is a privilege of the developers as we'll see now. Do Account Bans and Bot Purges Influence Prices? We have already explored the noticeable price-raising effect of mass account bans resulting from 'Operation: Unholy Rage'. At no other point there was an effect as lasting as the aftermath of this ban wave. This might also be in part due to the game's waning popularity which made it less worthwhile for sellers to reinvest and build up their supply again. On December 13, 2010 GM Grimmi, one of the masterminds behind 'Operation: Unholy Rage', announced in a developer blog post titled "Raging On" that "hundreds of accounts are banned every week for macro use." This suggests to us a period of intensified anti-RMT activities. There are some minor price increases following the post, but nothing nearly as profound as Unholy Rage. According to CCP staff, Unholy Rage took months to prepare, so it's unlikely that the company can afford similar extensive projects on an on-going basis, especially with their recent down-sizing. However, it does show that these thorough purges have the biggest effect on currency prices. 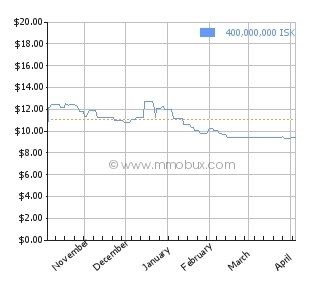 For the trivia buffs, the highest ever price recorded in our pricing data was $39.96 for 400 million ISK on June 19, 2007, which coincidentally was also the launch of the Revelations II expansion. 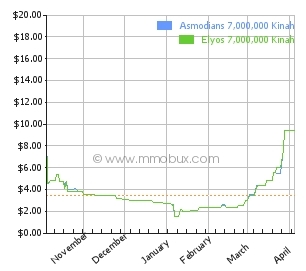 Just a week after that - and the subsequent release of the Game-Time Card - ISK prices plunged by a third to roughly $26. 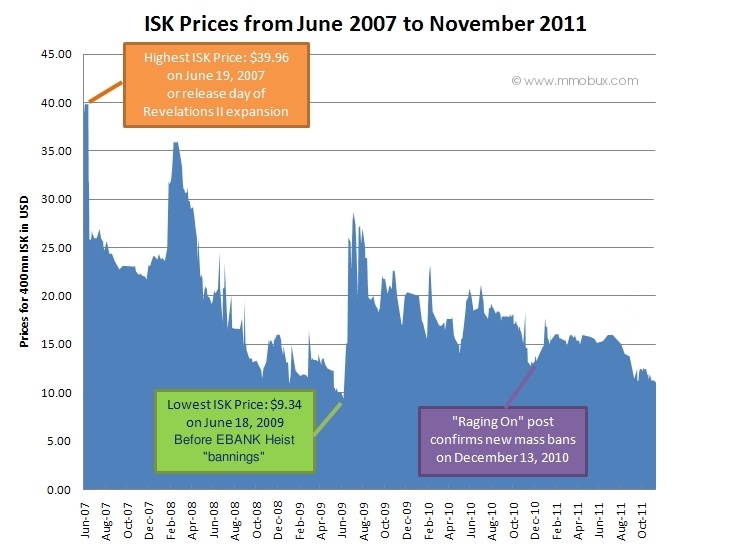 The lowest recorded ISK price was $9.34 on June 18, 2009, after which followed a massive spike in ISK prices that would persist for more than a year. Since the recording of the data, prices have made a slight dip, but stayed in the range of around $10 for 400 million ISK throughout 2012 as can be seen in our current day chart.